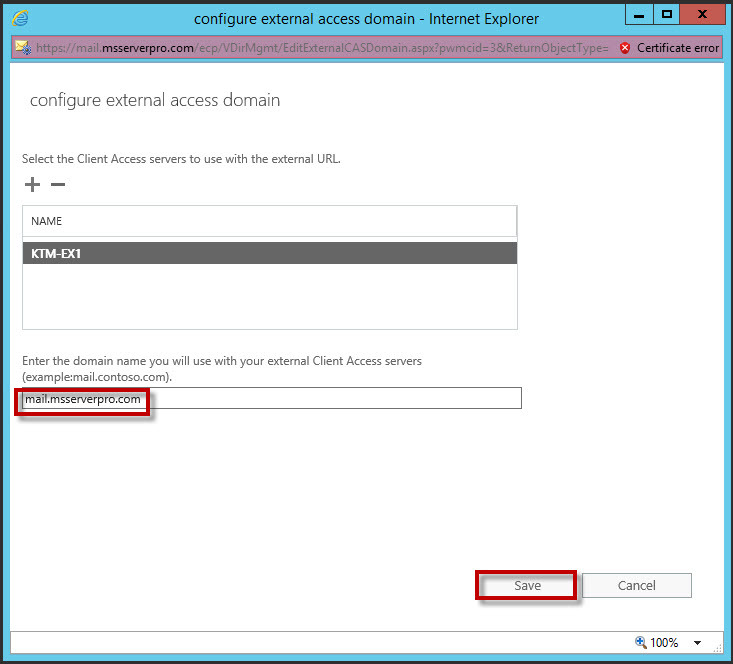 Client Access namespaces are defined URLs (External and Internal) used by clients to access Exchange Server 2016. 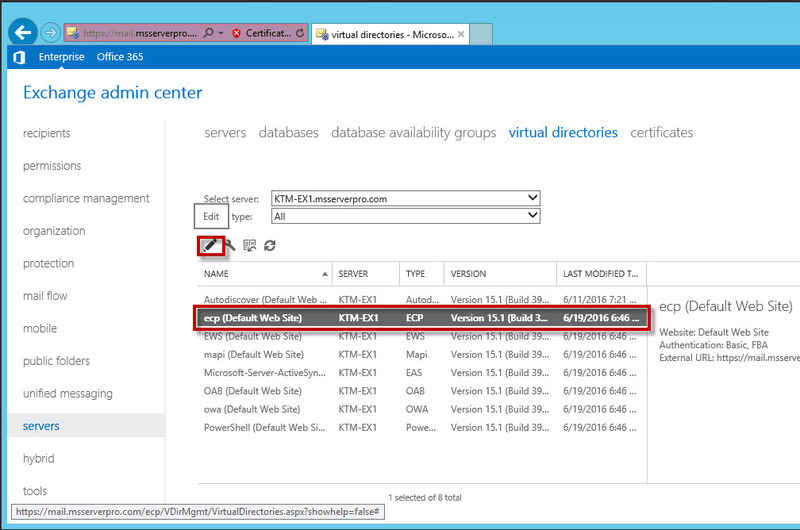 In a single site, the namespaces configuration are shared by servers. In the multiple sites, you can implement one or more namespaces. You should select a meaningful namespace because clients might use it to access Outlook over the Intranet and Internet. For example, mail.msserverpro.com would be a common namespace to use. 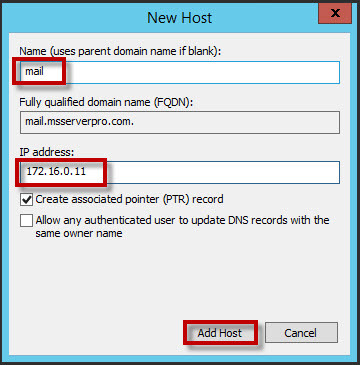 If there are multiple sites with Exchange Server, then you should have namespaces based on physical locations such as mail.np.msserverpro.com. 1. 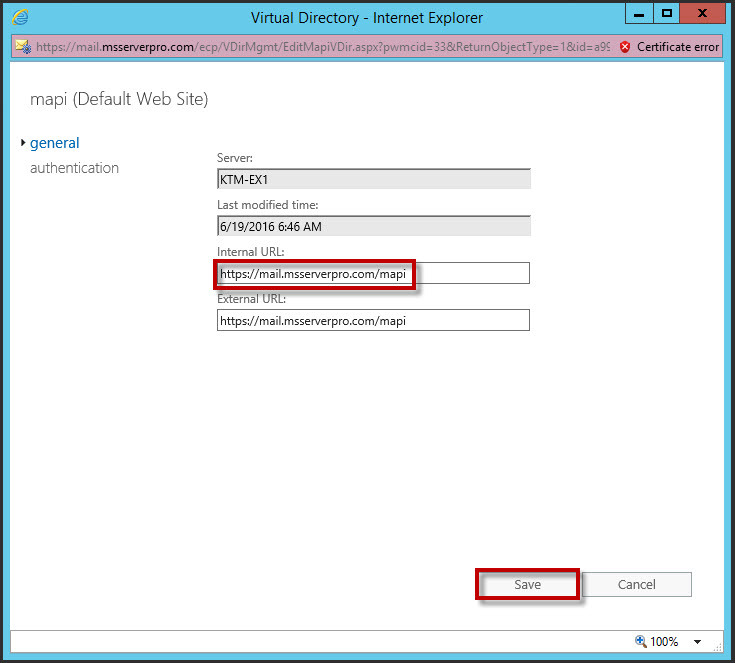 Create a DNS record for the namespace. 2. Configure the SCP for Autodiscover. 1. On KTM-DC1, in Server Manager, click Tools and then click DNS. 3. Right-click com and then click New Host (A or AAAA). 4. In the New Host window, in the Name box, type mail. In the IP address box, type 172.16.0.14 and click Add Host. 5. In the DNS window, click OK.
6. In the New Host window, click Done. 1. On KTM-EX1,Open Exchange Management Shell. type Get-ClientAccessService | fl name,auto* and press Enter. Get-ClientAccessService | Set-ClientAccessService -AutoDiscoverServiceInternalUri https://mail.msserverpro.com/Autodiscover/Autodiscover.xml and press Enter. 4. Close Exchange Management Shell. 1. On KTM-EX1, Open the Exchange admin center. 2. 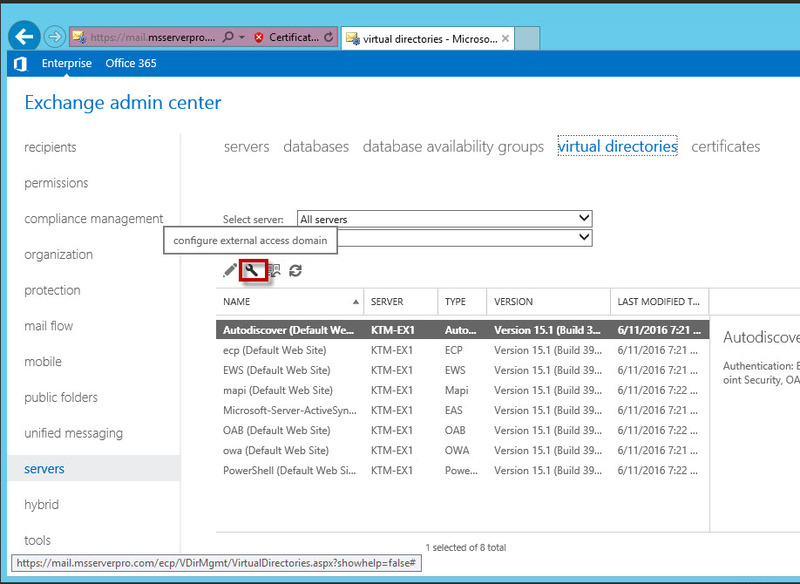 In Exchange admin center, click servers and then click the virtual directories tab. 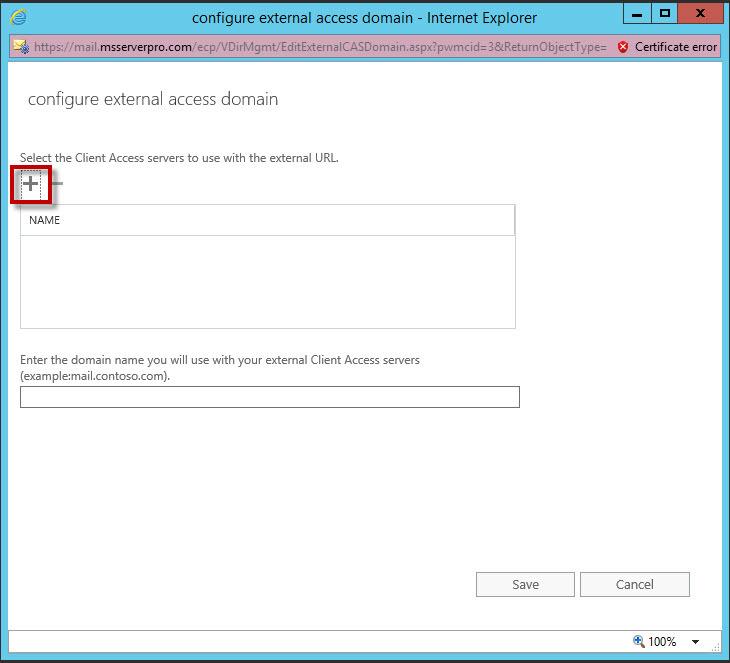 In the toolbar click configure external access domain (the wrench icon). 3. 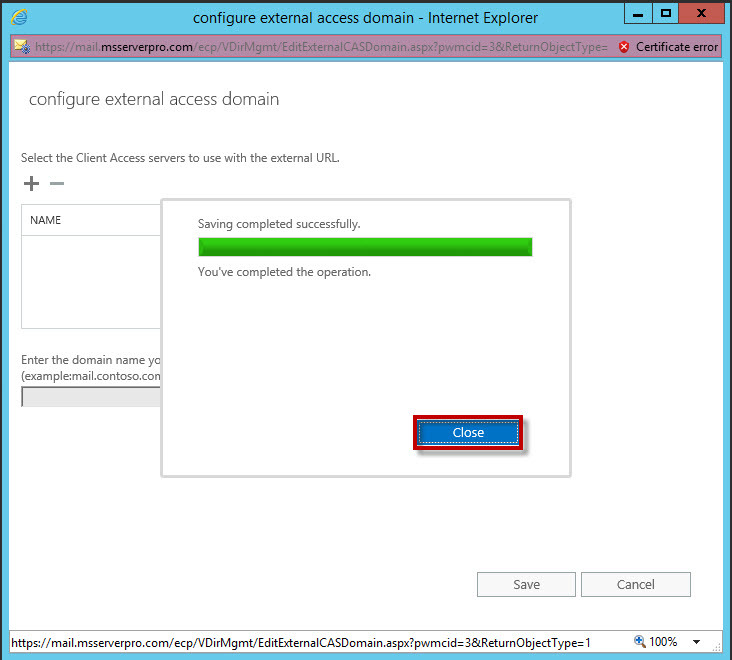 In the Configure external access domain window, click Add. 4. 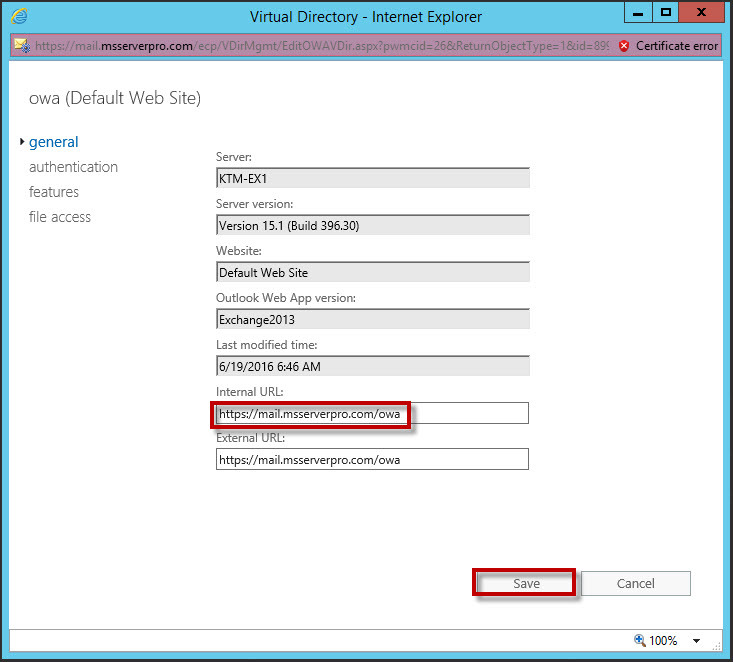 In the Configure external access domain window, click Add. In the Select a Server window, click KTM-EX1, click add, and then click OK.
5. 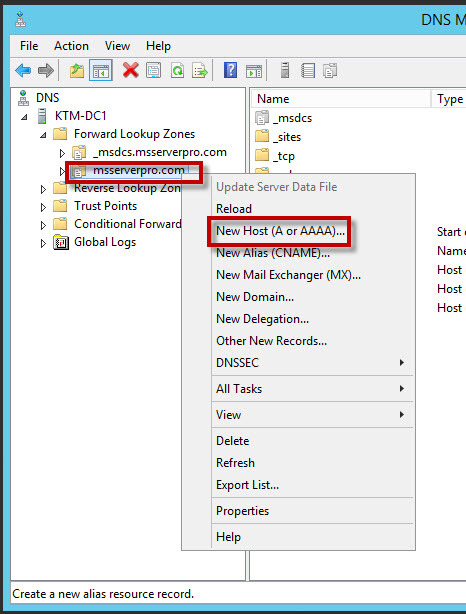 In the Configure external access domain window, in the Enter the domain name you will use with your external Client Access servers box, type mail.msserverpro.com and click Save. 6. When Saving completed successfully, click Close. 1. 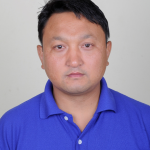 In Exchange admin center, on the virtual directories tab, in the Select server box, select KTM-EX1.msserverpro.com. 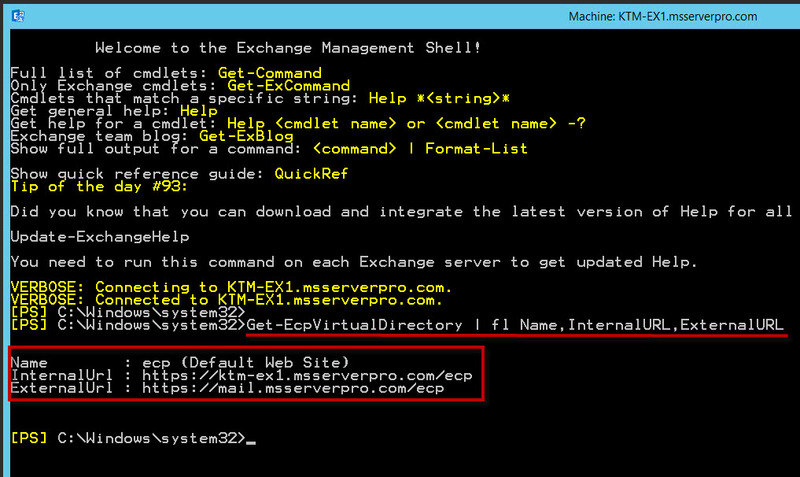 Edit each of the virtual directories except Autodiscover (Default Web Site) and PowerShell (Default Web Site) and change the Internal URL from KTM-EX1.msserverpro.com to mail.msserverpro.com. 2. Click ecp (Default Web Site) and then click Edit. 3. 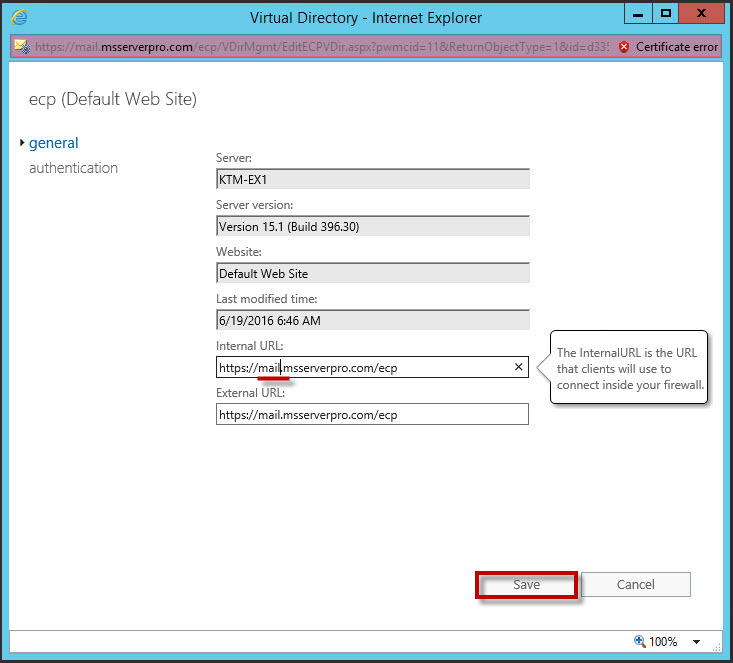 In the ecp (Default Web Site) window, in the Internal URL box, type https://mail.msserverpro.com/ecp and then click Save. 4. In the warning window, click OK.
5. Click EWS (Default Web Site) and then click Edit. 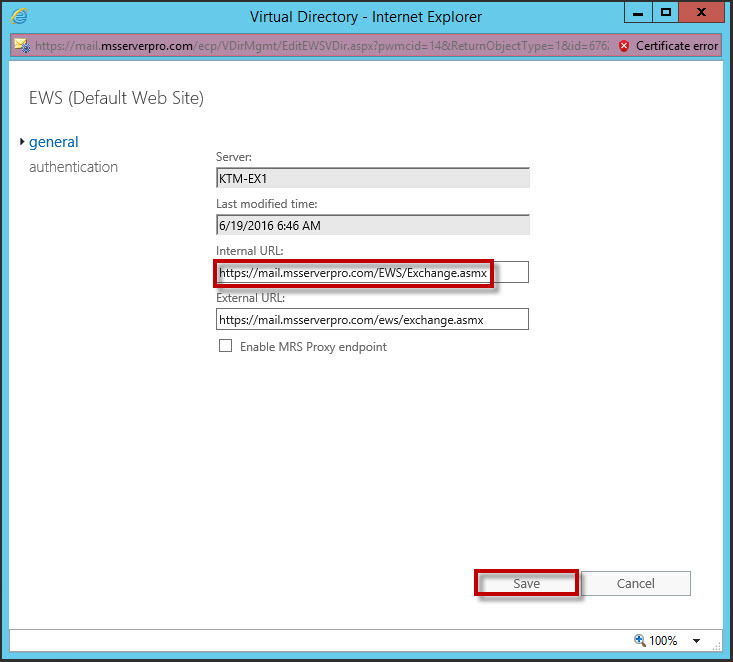 In the EWS (Default Web Site) window, in the Internal URL box, type https://mail.msserverpro.com/EWS/Exchange.asmx and then click Save. 7. Click Microsoft-Server-ActiveSync (Default Web Site) and then click Edit. 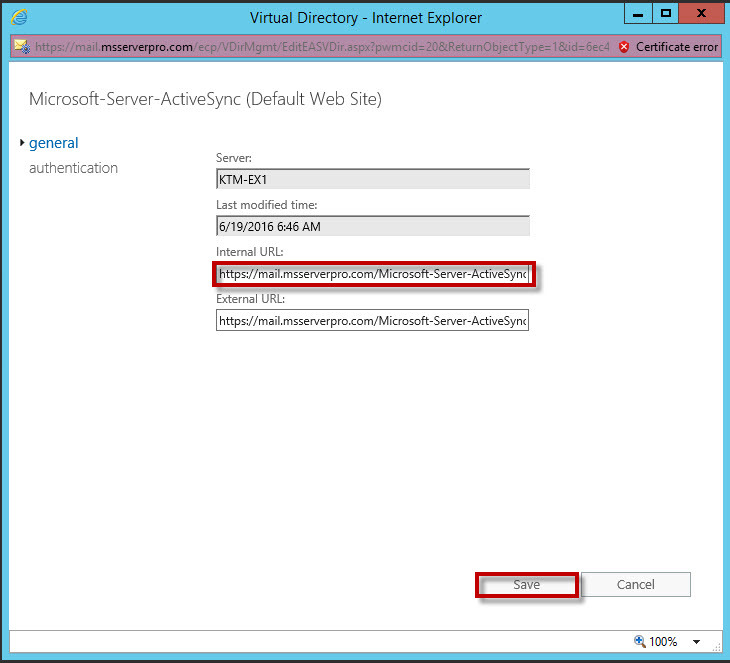 In the Microsoft-Server-ActiveSync (Default Web Site) window, in the Internal URL box, type https://mail.msserverpro.com/Microsoft-Server-ActiveSync and then click Save. 8. Click OAB (Default Web Site) and then click Edit. 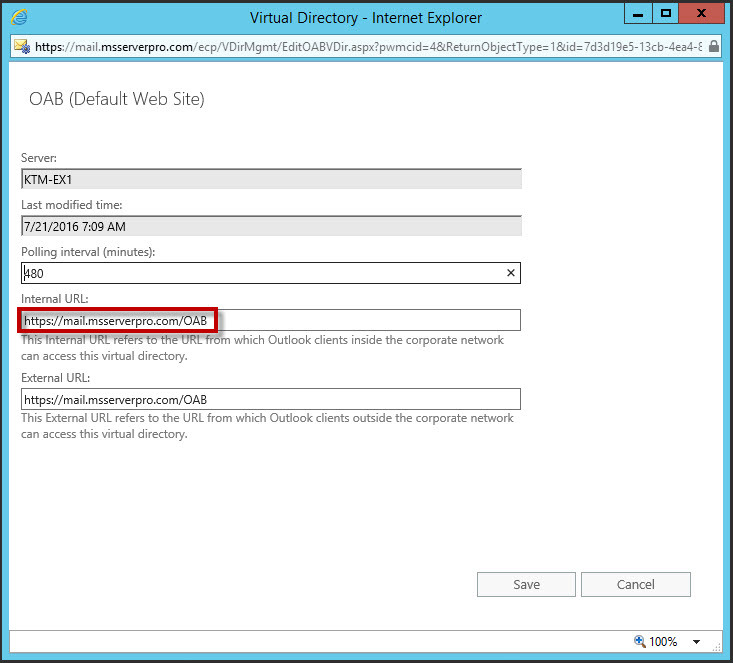 In the OAB (Default Web Site) window, in the Internal URL box, type https://mail.msserverpro.com/OAB and then click Save. 9. Click owa (Default Web Site) and then click Edit. 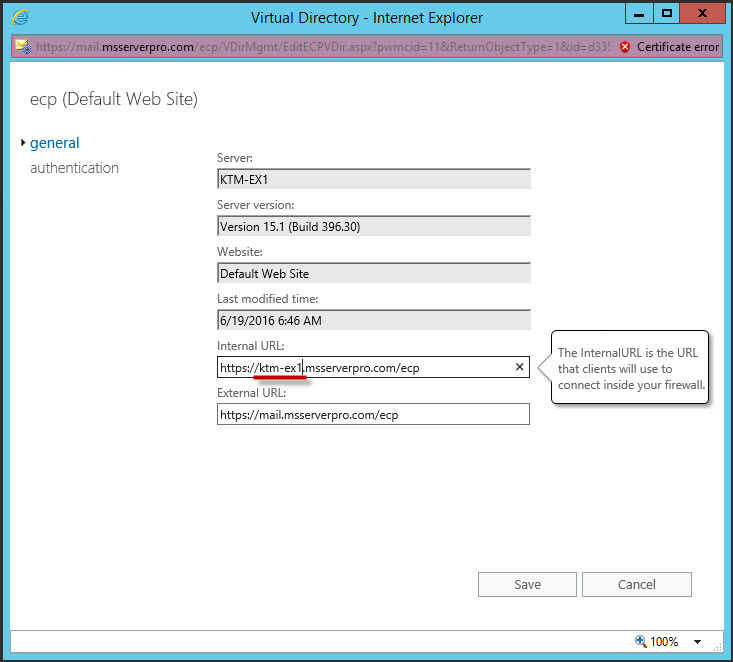 In the owa (Default Web Site) window, in the Internal URL box, type https://mail.msserverpro.com/ecp and then click Save. 10. Click mapi (Default Web Site) and then click Edit.In the mapi (Default Web Site) window, in the Internal URL box, type https://mail.msserverpro.com/mapi and then click Save. 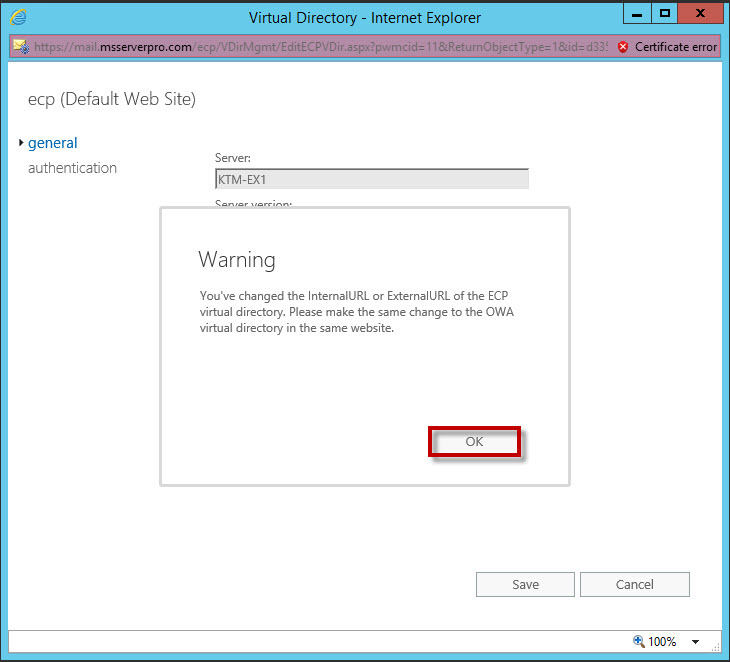 In this article, you have configured each virtual directory with an internal URL and an external URL. These URLs are the namespaces used by clients to connect to client access services. 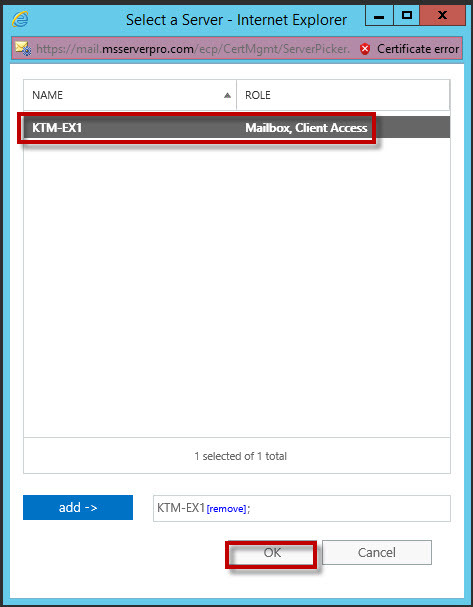 I hope this article will help in configuring client access namespaces using the Exchange Admin Center and Exchange Management Shell.